I brought in my 2011 Audi S5 down to Audi Wilsonville to get my winter tires and wheels taken off, stored and my summer tires and wheels put back on. Since I had a few appointments to attend to in the morning, I had requested a service loaner for the day when I set up the service appointment. When it comes to which service loaner I get, there are times that I can get something close to or the model that I had asked for. This time, I kind of wanted to be surprised but had already mentioned to Scott Mitchell that I, at some point, would like to test drive the new A3 sedan (both 1.8TFSI and 2.0TFSI quattro). Well, was a bit surprised to be able to get one of the new A3 1.8T demo cars as a loaner. The A3 loaner that I got for part of the day is a Glacier White in Premium Plus trim with the MMI Navigation plus package. For those that don’t know, the A3 1.8T is only available in FrontTrak, front wheel drive. 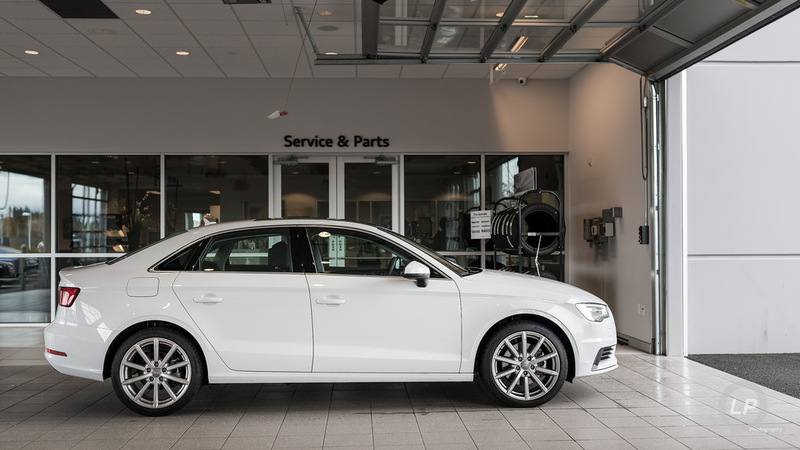 The A3 2.0T is only available with a Haldex-based quattro all-wheel drive setup. No matter what engine and drivetrain setup you choose, the A3 sedan uses an S Tronic 6-speed dual-clutch gearbox to send power to the appropriate wheels. Since I only had the A3 for part of a day, I won’t go into a full review of the A3 sedan yet. Instead, I have included a few things that I want to note from the driving experience so far. With the gearbox in S mode, it loves to keep the engine between 3200 and 4000 RPM even when not accelerating. On the highway, that means that the gearbox is usually a gear or two lower than that you would expect. With the gearbox in normal D mode, it will want to shift to sixth gear as soon as possible and hang on to it for as long as it can. This does mean that you’ll have to kick it to S mode or downshift a 1-2 gears in order to pass someone or prep for going up a hill before actually going up the hill. In city driving, the 1.8TFSI provides a decent amount of power; and, while it’s okay on the highway, it does feel a bit sluggish when accelerating at speed. You just need to make sure you’re in the correct gear. When pushed, engine noise gets up there, but not too intrusive. There is a bit of turbo lag and lag when pressing the gas pedal with some vigor at lower engine RPMs. Turbo lag goes away for the most part when at speed, but the throttle-by-wire lag still exists. The latter is common amongst most Audi models. With mostly highway driving, I was able to achieve 28-29 MPG (as calculated by the car’s computer). While driving spiritedly, it’s not uncommon to see 20 MPG. The shift from 1st to 2nd is pretty smooth, but seems to be a bit rough going from 2nd to 1st. 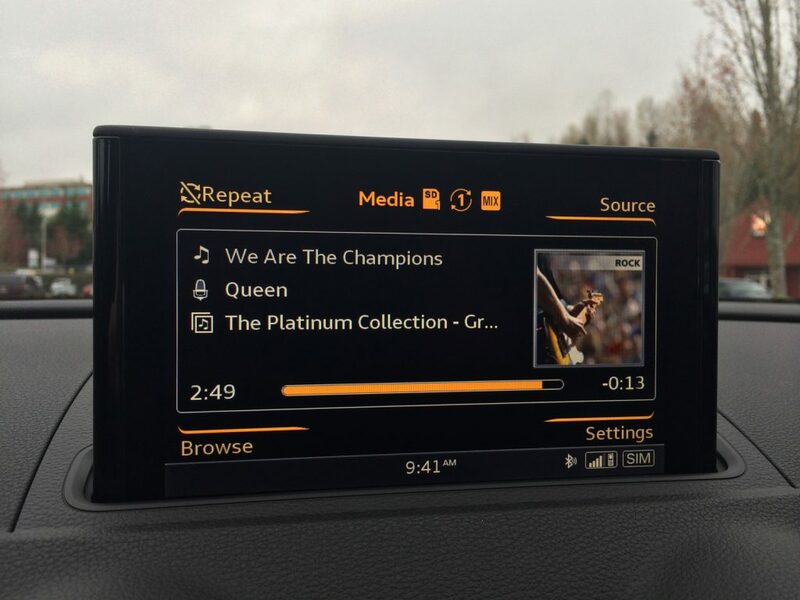 At least with the MMI Navigation plus package, the ways to browse media on an SD card is a lot more intuitive and has a lot more features (Cover Flow, browse by artist, album, genre) compared to the current MMI Navigation plus set up in the A4 and A5 family. The driver information display between the tachometer and speedometer is somewhere between the 2011 S5 and the current A6 family in terms of features, including a digital compass. I am so used to the forward placement of the side mirror and window controls in the S5, the controls seem to be a bit too far back on the door. Seating position felt a bit higher than I initially expected, but that could be due to being used to the low seating position in the S5. That said, the seats were comfortable and I was able to get the seat and steering wheel adjusted to where I wanted without any fuss. The panel with the 12V outlet in front of the two cup holders should be where the AMI and USB ports be located, rather than under the center armrest cover. The USB port should also be more than just a charging port. I am hoping to be able to take a 2015 Audi A3 sedan with the 2.0TFSI engine and quattro for a spin in the near future to compare it against the A3 1.8T. Huge thanks to Audi Wilsonville for letting me drive the A3 sedan as a service loaner! Glacier White is beautiful on the A3 and would love to see one in red. I think there is a push towards” bluetooth-ing” audio and that may be why the port is charging only. I would have hoped they would put the port in a more accessible location but perhaps they are thinking their clientele prefers to hide their phones and not have them out while driving. It’s a great way to ensure people order the nav package! I can’t wait to hear your thoughts on the 2.0 – if I get one that is the model I would get. It also sounds like the DSG (or whatever Audi’s fancy term for it is) is working much the same way as in my 2011 Golf right down to the high RPMs in “S” and the 2-1 shift-point. But once you have drove a DSG you are suckered in and a regular auto or CVT just won’t cut it. And I say that having suffered through a blown DSG at 14K. Bluetooth streaming does make things a bit easier, though it is nice to just be able to plug in a USB stick with music or podcasts vs loading it on to and depending on a BT Audio streaming capable device. I think some of the issues with the S Tronic/DSG would be solved if there was an extra gear or two to help with gear ratio spread. On the flip side, driving a car with a stick and doing a 2-1 shift isn’t always the prettiest or smoothest gear changes either. S Tronic/DSG reliability vs traditional automatic with a torque converter still needs to be worked out and it’ll take time for design improvements to be rolled in. I’m sure there will be loaners made available after the #AudiA3 launch events and parties. I was lucky to have connections that somehow made it happen for me. My next car! Do you know if they will be offering a TDI diesel in the new A3? If I remember correctly, the new A3 TDI sedan should start arriving in the US late-summer or fall along with the new S3 sedan. I agree with Nick. 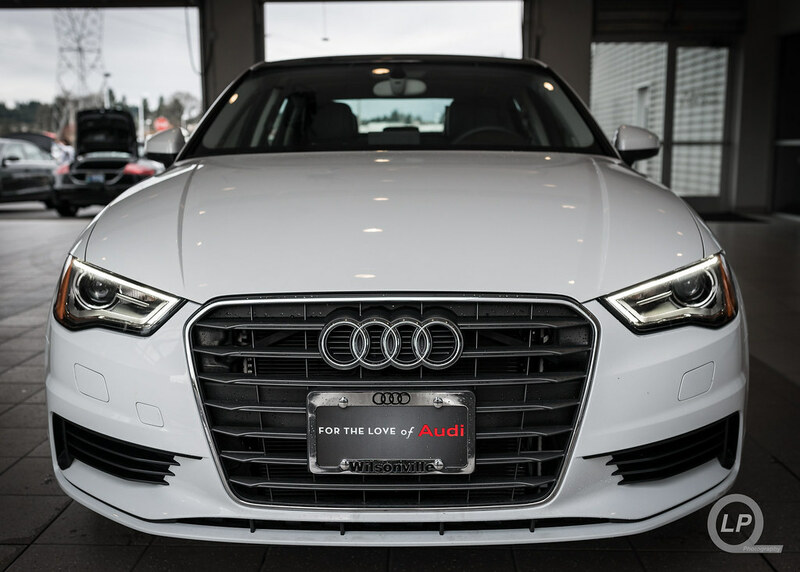 The A3 looks stunning in white! Couldn’t have it in any other colour.